WHERE: Sweeney Concert Hall, Smith College 144 Green Street Northampton, MA. WHEN: Saturday, May 12 at 7:30 pm. The Center for the Arts is pleased to present composer, performer, and guitar innovator Peter Blanchette directing the critically acclaimed Happy Valley Guitar Orchestra (HVGO) at Sweeney Concert Hall, Smith College on Saturday, May 12 at 7:30 pm. The concert is the world premiere of Blanchette’s Concerto for Guitar Orchestra. This three-movement work, the first-ever of its kind, celebrates the composer’s earliest musical memories, fragments of pop and ethnic music, absorbed in countless, solitary sessions, teaching himself to play the guitar by ear. 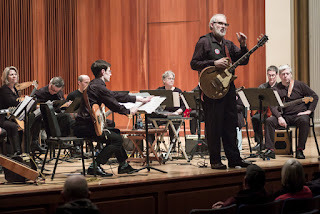 Steve Waksman, Chair of the Smith College Music Department writes, “Peter Blanchette's Concerto for Guitar Orchestra is a wonderfully rendered fusion of rock energy with the discipline of contemporary art music, like the Rolling Stones meets Philip Glass, using deceptively simple riffs to develop complex structures. Blanchette’s fine attention to the nuances of guitar tone really sets the piece apart. It takes an incredibly subtle ear to pull together the purest sounds of a nylon-string instrument and the overdriven bite of a solid-body electric without one overpowering the other, but here they sing in perfect harmony." HVGO is an avant-garde music ensemble founded by Peter Blanchette in 2009, with a roster of 15-20 acoustic and electric guitarists from widely varied traditions. Since its inception, HVGO has been a resident company of the Northampton Center for the Arts. It is supported by the D’Addario Foundation, the Massachusetts Cultural Council, and the Frank Lucchesi Trust. Though known as a Bach specialist, Blanchette has a repertoire of unusual and celebrated musical arrangements that run from medieval to contemporary to ethnic styles. He is a recipient of New England Public Radio Foundation’s Arts & Humanities Award for Outstanding Individual and is a veteran performer at Spain’s Cordoba Festival of the Guitar, Boston’s Symphony Hall, NPR’s “A Prairie Home Companion,” The Kennedy Center for the Performing Arts, and Town Hall, New York City. Tickets for the concert are $15 for adults, $12 for students and children. They are available in advance at www.nohoarts.org or Brown Paper Tickets and at the door from 6:30 pm on the evening of the performance. Door sales are cash or check only.